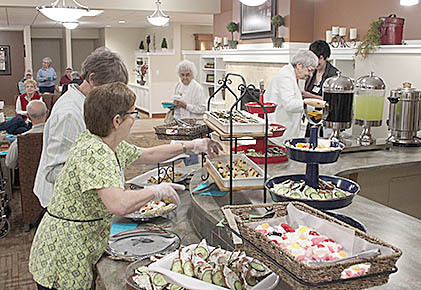 Refreshments were served during the GSS Albion open house on Monday. A large crowd was on hand to view the newly completed north wing at GSS Albion Wolf Home on Monday, March 6. The 15,000 square foot wing features 22 patient rooms, a large commons room, conference room, spa and kitchen/serving area. Some work remained to be completed in the mechanical room early this week. Clients were expected to start moving into the new wing on Tuesday. Among the special guests attending Monday was Ted Urban, consumer experience consultant with the Good Samaritan Society national campus.